I'm just lovin' it....: Silhouette MINT! I'm so excited, I have a new crafty toy! 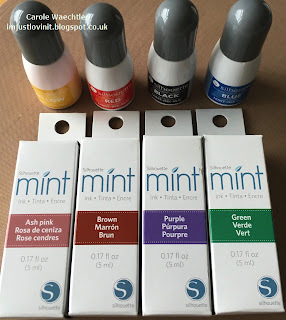 My Silhouette MINT arrived this morning, along with a few extra stamp sheets and inks. I really should have taken a photo of the unpacking of it all, whoops....I was excited, you know how it is! After taking everything out of the boxes and downloading the software, I knew immediately where I needed to start! I guessed that if I were to be making stamps the "MINT" way, i.e. 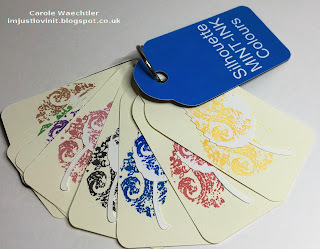 Design it, MINT it, Ink it, I'd need to have colour swatches of all the inks! Silhouette MINT stamping is different from what I'm used to. With a MINT stamp we ink it and leave the colour to soak in, making it easy to quickly stamp it again, without re-inking. Hence I needed a colour swatch, so that I could make the right decisions about what colours I wanted to put on my MINT stamps when I'd made some. 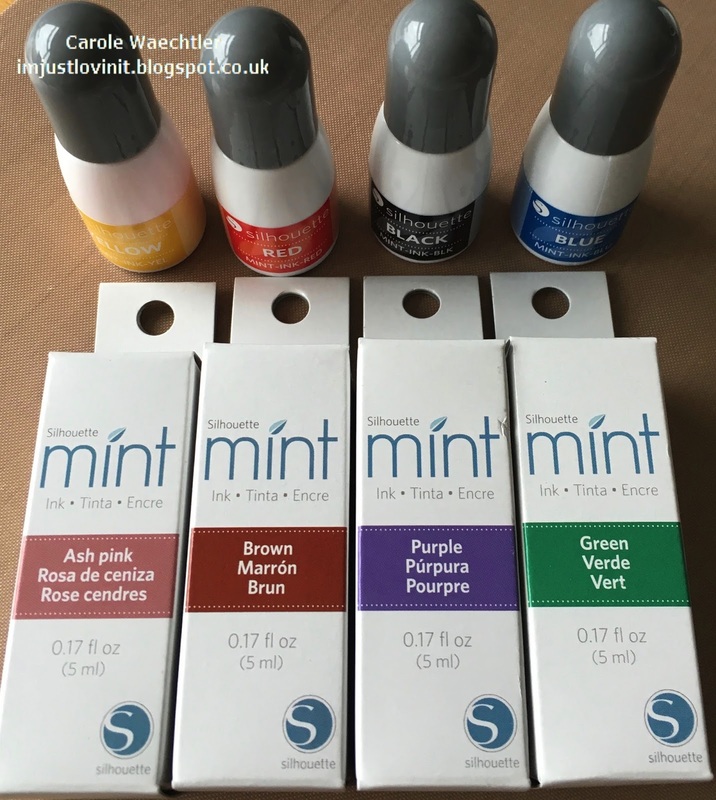 These are the colours that I'm starting with, the ones on the top of the picture all come with the MINT, the other boxed ones, were extras. After having a little think about how to make my colour swatch, I decided to cut some tag shapes and a mint leaf shapes out on my Silhouette Cameo. I cut the tag shapes out in cream colour and the leaf shapes out in white. I then took a very old (red rubber) paisley stamp, one I've had for years and years, to use just as a quick image to test the ink colours. 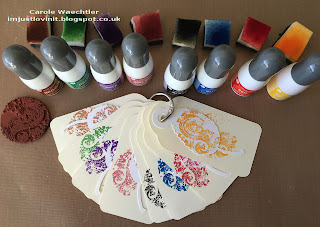 I put a couple of drops of the Silhouette MINT-INK onto my craft sheet and picked that up with a small piece of Cut 'n dry foam, which I used as a mini ink pad to ink up the test stamp. I stamped on both the white and the cream, to give me a good idea of how the colours looked, before even making my first MINT stamp. This is how the final colour swatch looks. After making my colour swatch, I found it easy to hold the different colours against my card stock and papers helping me to pick some card and papers for a card that will be on my blog tomorrow! Hope you all have time to craft with your Silhouette machines soon!